Seasonal affective disorder (SAD) is a type of depression that is related to the decreased light exposure in the winter months. I mentioned it last week as one of the possible causes of the "holiday blues", but it is an important topic that really deserves a full discussion of its own. What increases risk for developing SAD? Living far from the equator. The further you live from the equator, the shorter your days will be in the winter. Having major depression or bipolar disorder. Either of these can worsen seasonally. Family history of SAD or another form of depression. SAD is a complex issue, and probably has multiple triggers. There have been two very recent studies that suggest that SAD is related to special light-sensing cells in the back of the eye that have a direct circuit to the brain. When these cells detect shorter light exposure due to the shorter days, they appear to use this special pathway to send signals directly to the part of the brain that affects mood. Prior to this research, most scientists thought that there were only two types of cells in the back of the eye that responded to light (rods and cones which are essential to vision). There is still much research to be done in order to really understand the role these cells play in SAD, as well as how we might use that knowledge to help treat the problem. Exercise - Regular exercise helps to improve the chemical balance in your brain. It can help you to relieve stress and anxiety. It can also just make you feel better about yourself to be fit. Mind/body connection techniques - This includes, meditation, Yoga, tai chi, relaxation techniques, etc. Light therapy - This is one of the first line treatments for SAD. Exposing your eyes to more natural light by spending time outdoors is important, especially early in the day. A special light box can also be used that mimics natural outdoor light. When using light box therapy, you are exposed to this light within the first hour of waking up each day. Light therapy appears to be effective for most people suffering from SAD. However, it can trigger a manic episode in people with bipolar disorder, so patients with bipolar depression must be treated very carefully. Make sure to consult your doctor before starting any light therapy treatment with a light box. Psychotherapy - This can help you to learn healthy ways to cope with SAD symptoms, and learn to manage stress more effectively. Antidepressant medications - If you predictably have SAD every year, your doctor may recommend starting treatment before your symptoms typically start each year. If you feel that you may be suffering from SAD, we have both medical and psychological providers here on our staff who would be happy to answer any questions that you may have. If you have any questions about Seasonal Affective Disorder (SAD), please log into your account and send us your question. We are here to help. We think of the holiday season as a happy and joyous time of year. Unfortunately, for many people, this is a time filled with sadness, loneliness, or anxiety. There are many reasons why this may happen. I thought that I would take some time today to talk about the causes or triggers for the "holiday blues" as well as some ways to address those feelings. What causes the Holiday Blues? Grief from lost loved ones is often more acutely felt this time of year. Inability to be with loved ones who are far away. This time of year there is less daylight, which can cause actual changes in the chemical levels in the brain. This can lead to sadness or depression, sometimes severe. 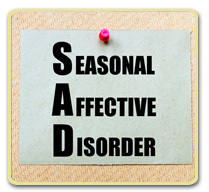 There is a condition called seasonal affective disorder, or SAD, which is considered a type of clinical depression. 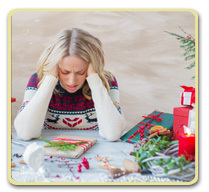 What can you do to effectively beat the holiday blues? Be a sun seeker - Try to get at least 20-30 minutes of sun light each day. If you have severe symptoms, you might even consider light therapy. Be sure to talk with your doctor, or get some advice from one of our doctors before choosing any light therapy solution. Exercise - A regular exercise program is another way to improve the chemical levels in your brain which regulate your mood and anxiety levels. Do something for others - Helping others is a great way to lift your spirits. You can volunteer with a local charity, visit a local nursing home, or just spend extra time with an elderly relative or friend who needs help and support this time of year. Talk about and tell stories about your lost loved ones. This is a great time to talk about fond memories. When those memories are shared, they bring that much more joy. Stay busy - If you know that the holiday season will be difficult or lonely for you, try to plan ahead and fill your calendar with fun events so that you are not spending too much time alone. But not TOO busy - If you get overwhelmed from overscheduling, slow down and enjoy some quiet time. Make time for rest and relaxation, or spending some one-on-one time with a special person. Don't feel like you have to go to every party or holiday event if you don't want to. Think outside the box - There are no rules for how you spend your holidays. If old traditions bring up sad memories, start new traditions. Don't wait to be invited to an event; invite others to your home instead. If cooking a big Christmas dinner is stressful, consider a potluck, or maybe a brunch instead. Just because you've always done the holidays one way, doesn't mean you have to continue doing the same things every year. Avoid too much alcohol - Alcohol worsens depression. Remember to sleep - Getting 8 hours of sleep does wonders for your mood and anxiety. "Count Your Blessings Instead of Sheep" - I love that old song! No matter what is happening in your life, try to focus on the good things rather than the bad. Taking the time to really think about and appreciate all of the positives in your life can really help improve your mood. With a little forethought, you can beat those holiday blues, and have a wonderful holiday season. If you have any questions about holiday blues, please log into your account and send us your question. We are here to help. This time of year, there are many temptations that might strain your usual good judgement when it comes to healthy eating. It is certainly easy to get carried away by all of the holiday merry making. Unfortunately, it is also easy to put on an extra 3-5 pounds over the holiday season, by just adding an extra 200-250 calories a day over the season. My own pecan pie recipe will add 200 calories for what some people would consider less than a full slice. And even though 3-5 pounds may not sound like much, most people find it difficult to lose that amount of weight after the holidays. It is possible to make some good choices that will allow you to get through the holidays with less guilt about your eating, and hopefully little change to the scales. Here are a few tips to keep in mind. It may sound simple, but planning can make a difference. Don't eat some of everything at the party. Take a first trip around the food table to look at all of the options, then choose only the foods that you feel are "worth the calories". Leave your least favorites for someone else. It takes a few minutes for your brain to get the signal from your stomach that it is full. Eat slowly, and spend plenty of time visiting with friends and family while you are eating and before going back for seconds or dessert. That time spent in conversation will make the gathering more enjoyable, and will give your brain time to realize that you are actually full. It just seems like more food on a smaller plate, and believe it or not, your brain can be fooled by things like that. Don't stand around the food at the party. Fill your small plate, then do your socializing away from the food. This makes it harder to mindlessly reach for more food without thinking about it. Getting more food becomes more of a conscious choice. Don't ignore the veggies or fruit on the buffet. You get more food for the same calorie expenditure. If you eat these first, you are less likely to overeat on the higher calorie foods. Don't go to the party starving. Before you go to a party, have a small snack that includes some protein and complex carbohydrates, like maybe some apple slices with peanut butter. This will help you to avoid over eating on unhealthy foods. Egg nog is high in calories, so consider other options or smaller portions. Alcohol on an empty stomach can increase your appetite and decrease your ability to control your eating. Drink alcohol only after having a little something to eat, and consider a glass of water between drinks. Dance the night away (or walk). Dancing is a great way to burn calories. If people are dancing at the party, by all means participate. If there is music at the party, maybe suggest some dancing. If you are at a family gathering, consider suggesting a group walk to look at holiday lights in the area before or after the meal, or maybe between dinner and dessert. If you are the one preparing the food, be creative with recipes and use less sugar, or more healthy fats, such as using canola oil instead of oils with higher saturated fats, or use half and half instead of heavy cream. I have been slowly decreasing the amount of sugar in many of my recipes without my family ever noticing. (Don't tell them.) Choose turkey or fish instead of red meats. Fish is actually a Christmas Eve tradition in some cultures. Even though food is a big part of our holiday traditions, try to put more focus on being together with family and friends, telling family stories, laughing, and having fun. 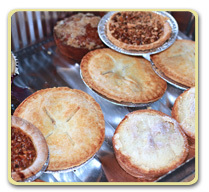 It is ok to indulge or overeat once in a while, as long as you try to balance that with moderation as your usual guide. I think if you keep these things in mind, you might be able to get through the New Year without having to add "lose 5 pounds" to your list of resolutions. If you have any questions about holiday weight gain, please log into your account and send us your question. We are here to help. This is the time of year that most Americans start decorating for the holiday season. Although we all love the decorations associated with the holidays, they do not come without some risks, especially for children. Here are some things to keep in mind to keep the holiday season safe. If you have a real tree, be sure to keep it watered to avoid over drying, which can increase the risk of tree fires, which can be quite devastating. Also keep any tree at least 3 feet from any heat source like a fireplace or radiator. Keep any decorations that include small objects or removable pieces (especially things that might look like candy) high enough that children can't reach them. A nativity scene is a great example. Baby Jesus is sometimes just the right size to cause a choking hazard! Also keep in mind that children might try to climb onto furniture in order to get to an especially enticing decoration. Make sure that furniture is bolted to the wall if it has any chance of falling over onto a child who might try to climb onto it. While holiday plants can be beautiful, they can also be very toxic to both children and pets. This includes Mistletoe, holly berry, poinsettia, and Jerusalem cherry. Consider an alternative. When trimming the tree or wrapping (or unwrapping) presents, be sure to gather up any pieces or torn wrapping paper, ribbons, bows, tinsel, or other small items and dispose of them appropriately. These things not only pose a choking hazard for small children and pets, but they are also a fire risk if near the tree or the fireplace. Always choose nonflammable or flame resistant decorations. If you are using tinsel or artificial icicles, make sure that they are made of plastic and do not contain lead. Never light candles on or near a Christmas tree or other greenery. Do not leave candles unattended or in an area where they may be knocked over. Consider using artificial candles. Protect your lungs, eyes, and skin when using any potentially irritating chemicals. Artificial snow spray, for instance, can cause significant lung irritation if inhaled. Inspect any light strands prior to using them to be sure there are no exposed wires or cracks in the casing that might pose a fire hazard. Read the directions with each light strand regarding how many strands can be safely strung end to end. Maybe choose LED lights over traditional because they do not release the heat of a traditional light. Never overload electrical outlets. Buy lights and extension cords from trusted retailers and reputable brands. Always unplug decorations before leaving home or going to bed. Be careful if using vintage decorations, which may contain asbestos or lead, as they were made before we knew of their potential dangers. 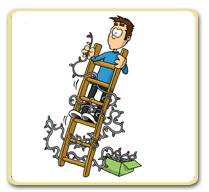 Also remember some general safety advice you learned from your parents - Use caution when climbing ladders, and keep breakable or sharp objects completely out of children's reach. By taking some simple precautions, you can ensure this holiday season will be a safe and enjoyable one. If you have any questions about decorating safety, please log into your account and send us your question. We are here to help. Health Tips: Do I need antibiotics? Last week was U.S. 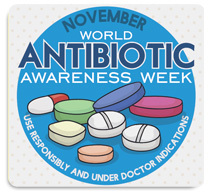 Antibiotic Awareness Week. This happens annually in an effort to highlight the steps that everyone can take to improve how and when we use antibiotics. Antibiotic resistance is a serious problem in the world today. Bacteria have many ways in which they can become resistant to antibiotics, meaning that they develop ways to overcome the particular way in which an antibiotic is designed to kill them. Every year, at least 2 million people in the U.S. become infected with bacteria that are resistant to antibiotics. Almost 25,000 people die each year as a direct result of this problem. The CDC estimates that at least 47 million antibiotic prescription each year are unnecessary. The more an antibiotic is used, the more likely bacteria are to become resistant to that antibiotic. This is particularly true when antibiotics are used inappropriately, such as when they are not taken for the full course of treatment when prescribed for bacterial infections, or when they are taken when they are not needed. Improving the way in which antibiotics are prescribed, and taken by patients, can help to fight antibiotic resistance. Limiting antibiotic resistance ensures that the medication will be available to help fight infections for many years to come. I want to talk today about when antibiotics will help, and when they won't. Antibiotics are only needed to treat certain infections caused by bacteria. These infections include strep throat, whooping cough, urinary tract infections, among others. Antibiotics will not help treat infections caused by viruses. These infections include the common cold, the flu, and the vast majority of upper respiratory infections that we have this time of year. Not only will antibiotics not help with viral infections, they can actually be dangerous. Antibiotics can cause serious, sometimes life threatening, side effects. In my own practice, I have had patients who have had extremely serious side effects to an antibiotic, which almost cost them their lives. You may be surprised to know that most sinus infections are caused by viruses, and will typically resolve within about 2 weeks without antibiotics. Bronchitis is caused by a virus over 90% of the time in otherwise healthy people. This infection can cause a cough and chest congestion that can sometimes last up to 5-6 weeks, but does not improve with antibiotics. Even ear infections can sometimes be caused by viruses. In infections which may be caused by a virus or bacteria, whether or not to use antibiotics depends on many factors. The choice should be weighed carefully, without automatically prescribing antibiotics. It is usually a good idea to try symptomatic treatment for a period of time to see if things will improve without antibiotics. Viruses can make you feel really bad. Don't think that I mean that you are not sick when you have a viral infection. In fact, the worst I have ever felt was when I had a viral infection. I just want you to know that antibiotics are not always needed. Antibiotics may seem to make us feel better, just because the viral infection improves with time. Sometimes, we just need time, and all of those things your grandma always told you to do when you were sick, like rest, drink lots of fluids, hot tea, steam, etc. If you have questions about whether your grandma's home remedy is the right one for you, just email one of our doctors. We are happy to help. For more information about this subject visit www.cdc.gov/antibiotic-use. If you have any questions about antibiotics, please log into your account and send us your question. We are here to help.